Appliqued by: Nancy S. Brown, Meg Cupman, Cynthia Demidovich Wynn, Linda Gavin, Sue Gragg, Linda Gruber, Andrea Hong, Jenny Kolbusz, Liisa Lyon, Lily Pang, Laurel Putnam, Melissa Quilter, Valerie Sopher, Katie Spangler, and Carolyn Weil. 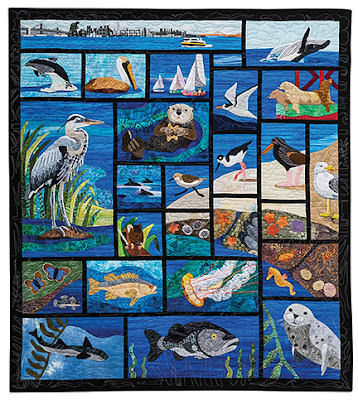 An original applique design by well-known quilt artist and teacher, Nancy S. Brown, “Bay Windows” captures the wildlife of the San Francisco Bay Area. The layers of the ecosystem move from the fish who inhabit the bay to the birds who live on the shores of the bay. On closer inspection of the San Francisco skyline can you spot our favorite non-California native, GODZILLA? The sense of humor and the attention to detail make this an outstanding art piece. This contemporary art quilt is an abstract original-design by Bay Area artist, Barbara Ramsey. Ms. Ramsey purposely distorts the geometric shapes and combines light and dark fabrics which in turn, draws the viewer's eye over the surface of the quilt. 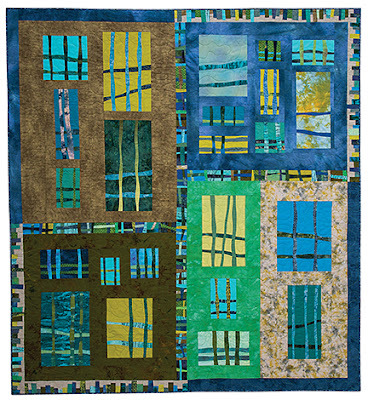 The use of batik and hand-dyed fabrics in a 4-Block pattern evokes apartment windows. The border treatment on two diagonal corners mimics a cityscape design with the other corners reflecting the sky, thus lending to the overall "High Rise" affect. You will be able to view these quilts in person at the following venues...See you there!